Twelve young Louisiana wrestlers travelled to Cedar Falls, Iowa, to participate in the USAW/Cliff Keen Kids Folkstyle Nationals, held from April 4th-6th at the UNI-Dome of the University of Northern Iowa. 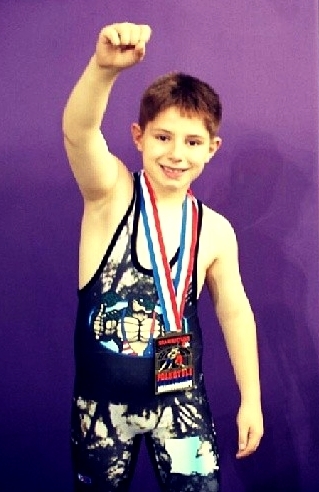 Eight-year-old Spencer Lanosga came back a national champion. 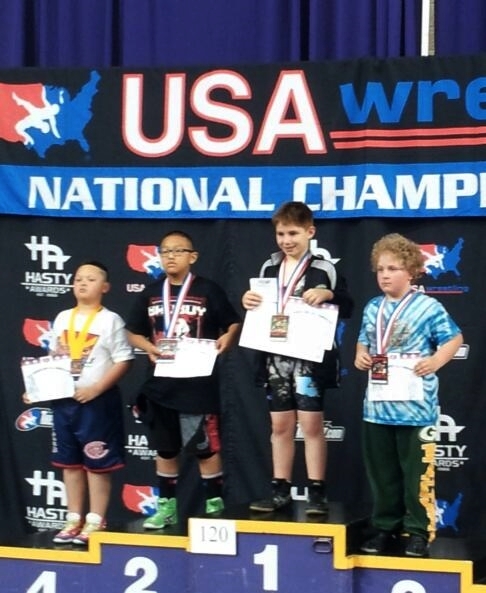 (L) Spencer Lasogna of Team Louisiana at the top of the podium at the USAW/Cliff Keen Kids Nationals in Cedar Falls, Iowa; (R) TW photo John Drake (2nd from left) placed 4th in the Novice 140+ lbs. class. Lanosga, of Team Louisiana, went 3-0, registering a 16-0 technical fall, a fall in 18 seconds and, trailing 2-0 in the third period of the finals, a fall in 2:53 to best the three other opponents in the Intermediate 120 lbs. weight class. Lanosga was named to the National Team and is ranked 2nd on the Future Olympians list for USAW, behind only the young man he defeated in the finals. His TrackWrestling profile lists him as "Perfect." His finals match, against Washington State's Rocco Clark, III, a Washington Greco-Roman and freestyle state champion with "BAD BOII" etched in his hair, was a grind. Spencer was taken down in the first round but could not escape. On bottom to start the second period he again could not get away from Clark. But in the third period, hoping to increase a precarious 2-0 lead, Clark started on bottom and found trouble getting away from Lanosga, who finally was able to force his opponent on his back and score a fall with seven seconds remaining to take the title. Spencer Lanosga with his "hardware" from 2013 and 2014. Lanosga will be entering the second grade later this summer at St. Francis Xavier School in Metairie. He has practiced with the Champion Wrestling Club, under his father Thomas Lanosga and former John Curtis two-time state champion and coach Norman Drake, since the first grade. 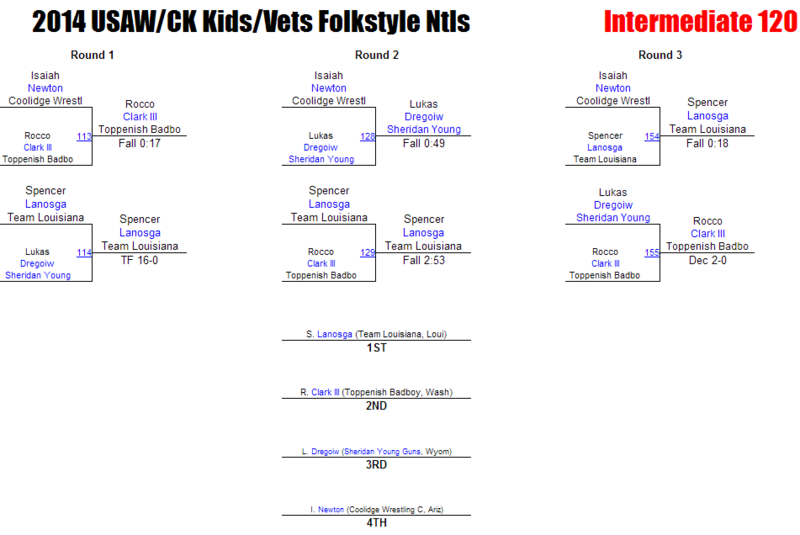 He is a two-time Louisiana Kids folkstyle state champion, having won the Bantam 90+ lbs. division in 2013. 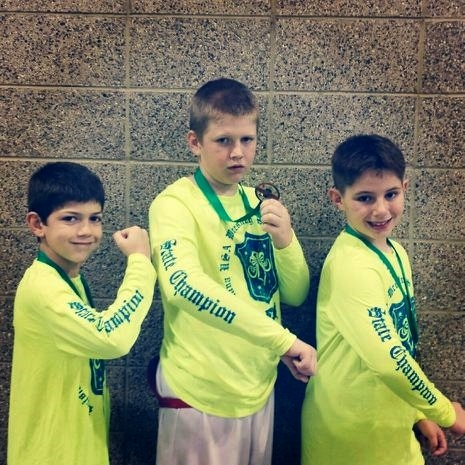 Before that event there were no other Bantam-class kids his size and he took his knocks with the Intermediate wrestlers until the state tournament in which some similarly sized Bantam kids were available. 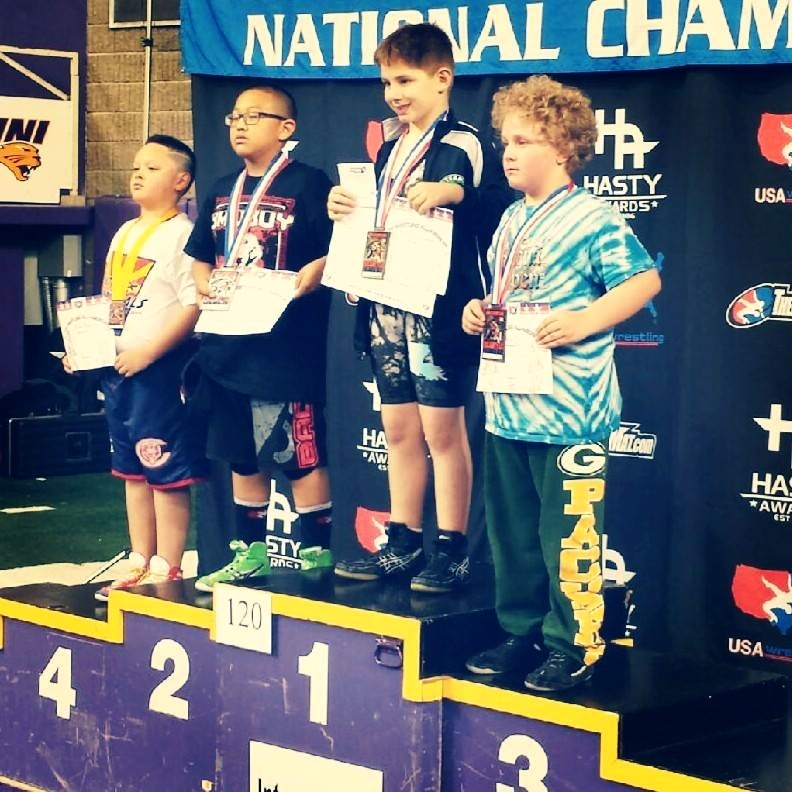 In 2014 he was undefeated in the Louisiana Kids folkstyle season, which included wins at the Greater Baton Rouge Open, the Jr. Spartan Open, the Tiger Open and the Jr. Storm Open prior to winning a second Kids Folkstyle state championship in the Intermediate 120 lbs. class. When asked what he likes about wrestling, he commented that he likes football, "and also physically hitting people." Even he knew that did not come out sounding very good, but he clarified that he was referring to the contact of football and wrestling, and that it did not apply to girls or his younger brother Sammy, who will soon turn three. His favorite moves include the "Bulldog (Cattle-catcher)," hip-toss, the "Butcher Block" and the rest of the cross-face series. When asked if he had a favorite wrestler Lanosga asked "Does WWE count?" He took the required chagrin in stride and when allowed mentioned his favorite WWE wrestler is Sheamus. Tito Ortiz of the UFC came next, but Daniel Cormier, a three-time state champion for Northside High School in Lafayette and a former Olympian, also came into the mix. So Lanosga is on the right track. 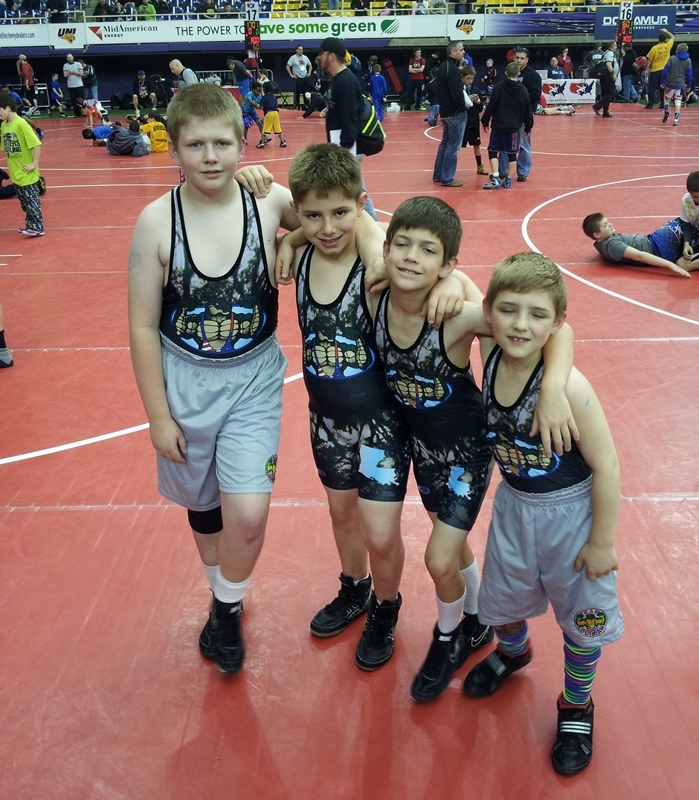 Louisiana Kids USAW state champions (left to right) John Drake, Spencer Lanosga, Zachary Drake and Nicholas Digerolamo at the USAW Kids Nationals in Cedar Falls, Iowa. Zachary Drake, John Drake and Spencer Lanosga at the LA Kids State Championships. Little brother Sammy Lanosga, who will soon turn three-years-old, gets his licks in when he can (or is allowed). 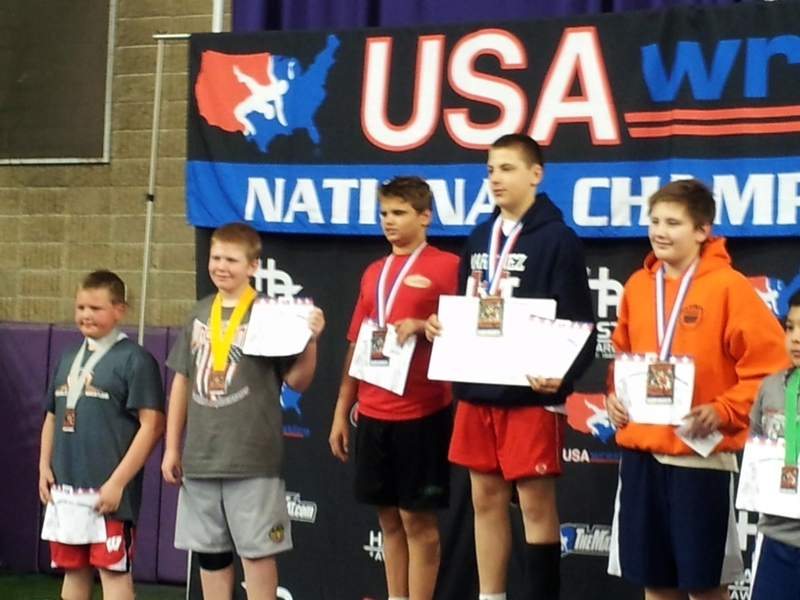 Landon Reaux (Intermediate 60 lbs.) won two matches by shutouts (16-0 and 6-0) and placed 8th. Zachary Drake (Intermediate 70 lbs.) also won a match by a fall in 1:38. The other Louisiana state champions were Gabe Dalton, Reed Bergeron, Colten Sonnier and Dawson Mire. Also making the trip were Ethan Boudreaux, Jake Bergeron and Vaughn Romero. Though not winning any matches these young men certainly benefitted by the experience of competing in a national competition, which should prove invaluable for them as they continue their wrestling careers.